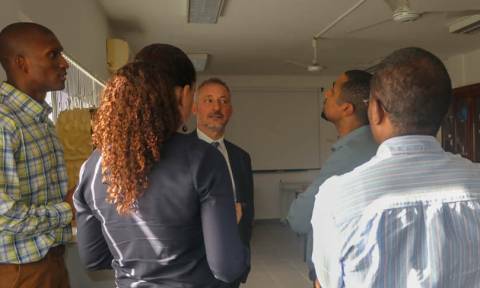 The University of Cape Verde received the visit of the Vice-Rector of the NOVA University of Lisbon, Professor João Amaro de Matos on January 16. The University of Development and Innovation - African Remote Lusophone (UDI-ARL) is a project proposal for Capacity Building in Higher Education, proposed by Universidade NOVA de Lisboa, which aims to train about 24 teachers / researchers in Europe and 12 administrative officers from Cape Verde and Sao Tome and Principe. The ultimate goal is to help the research centers to be active again and to function in an integrated way in different areas: Law, Regulation and Access to Justice, Information Management and Global Health. "Our idea is that the project starts in January 2020 and lasts for 3 years. In the first, teachers and researchers will spend two weeks in Lisbon, at the NOVA University Lisbon, a week in Holland, at the University of Maastricht and a week in Italy, at the University of Pisa to train. In the 2nd and 3rd years, teams of trainers would consolidate training in Africa". Briefly, members of Uni-CV will also travel to the New University of Lisbon for a very complete training in two transversal areas, namely Social Entrepreneurship, with a focus on fundraising, and Quality Management. Uni-CV Dean, Professor Judite Medina do Nascimento, pointed out that "NOVA University Lisbon has been our partner for many years, there are projects we have developed in the areas of Social Sciences, Geography and Information System."